Mr. Feldman knew it was already too late for major changes. Construction is well underway on The XI (the Eleventh), a mixed-use development at 76 11th Avenue that is transforming a full city block between 10th and 11th Avenues, and West 17th and West 18th Streets, directly south of the Frank Gehry-designed IAC Building. “We have all the natural resources — the water, the park, the High Line,” said Ziel Feldman, the chairman and founder of HFZ Capital Group, which is developing the project. The west tower has interiors designed by Gabellini Sheppard. With Bjarke Ingels Group, HFZ is developing a project that aims to establish its own micro neighborhood. On the large, western portion of the site, there will be two travertine-clad towers, which twist and shift proportions as they rise, along with a lower building on the southwest corner connected by an enclosed glass bridge. 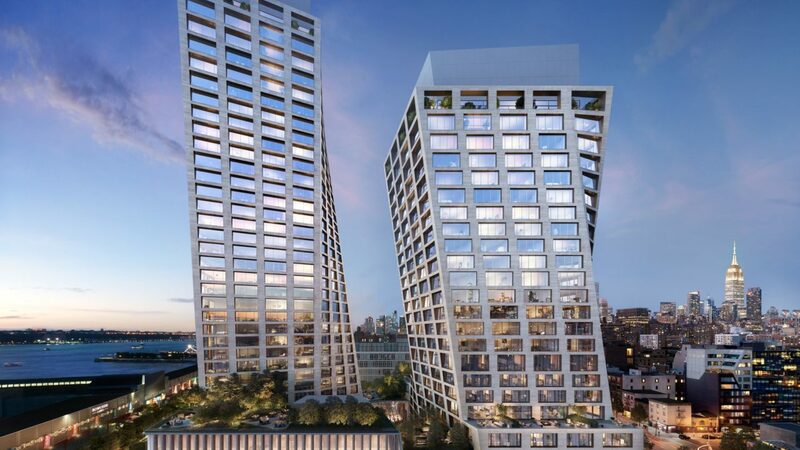 The westernmost tower, rising 36 floors and about 400 feet, will have 149 condos with interiors designed by the New York firm Gabellini Sheppard. The east tower will rise 26 floors and about 300 feet and contain a Six Senses hotel on the lower floors and 87 condos from the 11th floor up, all designed by the Paris firm Gilles & Boissier. The lower building will serve as a yet-to-be-determined art space and Six Senses spa and club facilities. At the center will be a porte-cochere and courtyard with plantings, designed by the Swiss landscape architect Enzo Enea. The center of the project will have a porte-cochere and courtyard with plantings, by Enzo Enea. Underneath the High Line, Mr. Ingels is planning pavilions with restaurants and retail stores, leading to a park on the eastern edge of the site designed by Field Operations and Diller Scofidio + Renfro, which HFZ is developing with Friends of the High Line as a street-level extension of the popular elevated walkway. Mr. Ingels said he designed twisted towers in order to maximize desirable views for residents inside, by allowing the buildings to peek around each other and neighboring structures. The eastern tower twists in the opposite way, he added, maximizing lower-floor views east and west, to the High Line and Hudson River, but then prioritizing views north and south over the city at the top. Inside the west tower apartments, “There’s a real emphasis on natural materials, to reflect natural elements embedded throughout the building,” said Kimberly Sheppard, a partner at Gabellini Sheppard. The materials include wide-plank oak floors, gray larch wood Bulthaup kitchen cabinets with White Princess quartzite counters, and master bathrooms with eucalyptus wood vanities and walls clad in Taj Mahal quartzite with a leather-textured finish. In the east tower, Gilles & Boissier will extend the atmosphere of the Six Senses hotel it is designing into the residential apartments. Dorothée Boissier said her firm sought to mix polished and textured finishes to play up the natural character of materials, much like Gabellini Sheppard. However, the end result has more contrast. The Molteni kitchens have smooth lacquer doors installed near others with a pronounced, brushed wood grain, and a mix of white Calacatta Gold and black Grigio Carnico marble. Master bathrooms have herringbone floors of light Arabescato Vagli Oro marble set off by a border of dark Saint Laurent marble. The amenity package includes a 4,000-square-foot fitness center with a 75-foot-long pool, a lounge and gallery in the glass bridge, a wine tasting room, a social lounge with billiards tables, a teen room and a children’s playroom, in addition to priority access to Six Senses. Sales are scheduled to begin on May 7, with the launch of a sales gallery with an immersive installation by the designer Es Devlin at 25 Little West 12th Street. One-bedrooms will start at $2.8 million, two-bedrooms at $3.9 million, three-bedrooms at $6.5 million, four-bedrooms at $9 million and half-floor penthouses at $25 million. The target completion date, said Mr. Feldman, is the last quarter of 2019.